Business environment is an important segment that needs to be sustained, because it is a job-generating and it ensures well-being. The opinion belongs to PDM chairman, Vlad Plahotniuc. The leader of the Democrats went to several businesses in the Capital to see how the government's fiscal reform works after entrepreneurs complained they were choked by bureaucracy, taxes and unwarranted controls for years. One of the factories visited was the largest and oldest enterprise in the light industry in our country. Over 600 employees produce clothes for the shops in Moldova, but also for world-renowned brands. The PDM chairman, who has extensive business experience and knows the issues here, told employers and employees that he has necessarily improved the situation in the field. This is because the business environment is the engine for the development of a country's economy and must be fully supported by the authorities. 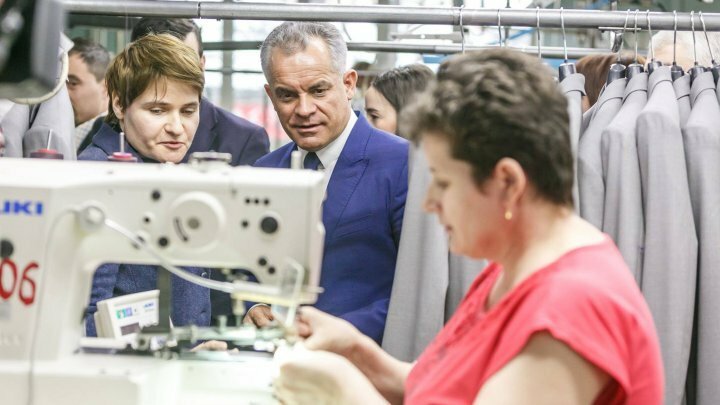 "We thought and the government intervened in 2016 with fiscal policies that helped the businesses", said Vlad Plahotniuc. Factory director Tamara Luchian has been working for 46 years in the industry and says that any measure in favor of business benefits not only economic agents but also employees. "Everything has benefited each economic agent, every person. We are for support", mentioned factory director Tamara Luchian. Everybody appreciate the changes for development when they earn higher salaries. "It's easier now. I'm happy to work". "Chiril Gaburici has an important role to implement tax reform. He's running for parliamentary elections. He tried a jacket on the visit to factory. "The greatest gratitude of yours is that over the world, people wear clothes made in Moldova. I thank you for that", said Chiril Gaburici, PDM candidate in Chisinau, 31st constituency. Fewer control institution and permissive actions enabled another company which produces paints. In the last three years, the average salary has risen by 1,800 lei. A better situation is also the Moldovan Railways State Enterprise. The current government has managed to pay all salary arrears of 104 million lei accumulated by 2015. "We had to get involved so that the employees were paid. It was unacceptable that you don't receive salaries for half a year", said Vlad Plahotniuc, PDM candidate. PDM chairman Vlad Plahotniuc went on to talk with employees from Moldtelecom. They were interested in the plans of the governing party after the February 24th elections. "What will be major projects we can expect and enjoy in the Republic of Moldova in the future?" asked an employee. "We want to build highways. We want to build twice as much as we built this year in every village. We want to advance gasfication, water and sewerage system", concluded Vlad Plahotniuc.